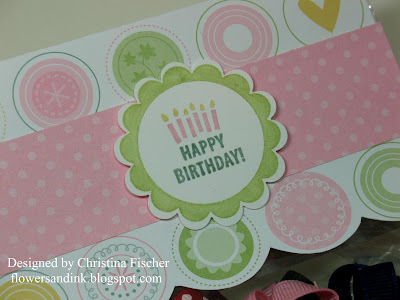 This week is Birthday Week at All That Scraps. C.C. Designs is celebrating its First Anniversary with five new sets and a background! Here's a peek at the C.C. Designs set Beautiful Butterflies. This set has two butterfly images and three sentiment stamps. When I saw it I immediately thought of elegance, so that's what I tried to achieve with this card. The white panel is C.C. Designs new White Cardstock. Its 140 lb. weight makes it more sturdy than Whisper White, so it can be used for a card base. 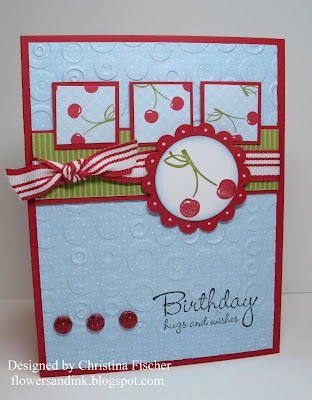 I chose to layer it on Basic Gray for this card, so it would be able to handle all the embellishments! To create the bottom border I first used my Scor-Pal to score two lines, then I embossed below the lines with my Cuttlebug and D'vine Swirls embossing folder. 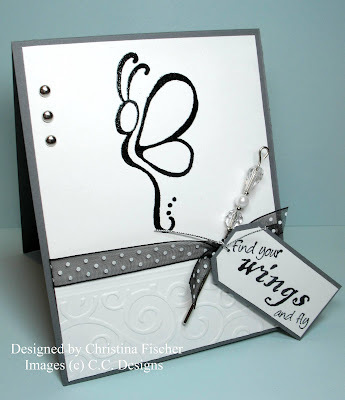 I stamped the butterfly image in Versamark and heat embossed it with Black Embossing Powder. I used the Pretties Kit to make the pin. Hello everyone! Did you know that C.C. 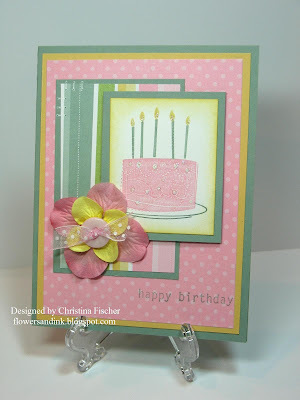 Designs is celebrating its First Anniversary with FIVE new stamp sets and a new background?!? I opened my Design Team package yesterday and couldn't wait to get started! Christine and the Design Team will be unveiling a new set each day until the release on Friday, April 4 at 12:01 AM. 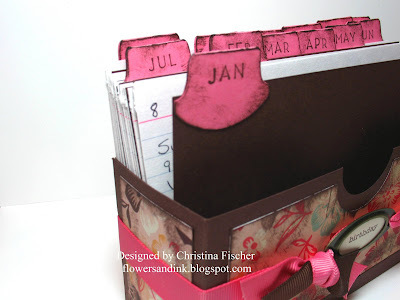 You can check out the All That Scraps Blog this week for more samples and some giveaways! 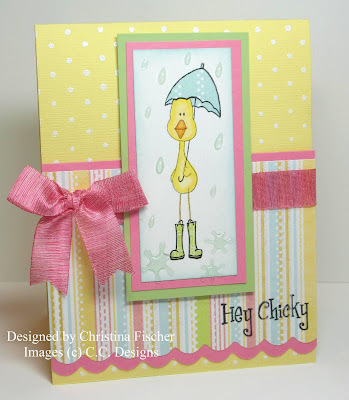 Today I have two cards I made using Hey Chicky. This is SUCH a cute set -- four different chicks and a sentiment. I had a lot of fun making these samples! On the first card, I stamped the Polka Dots Big Ol' Background in White Craft Ink and embossed with White EP. The Chicky is colored with Copic markers, and I paper pieced the umbrella and boots. I picked up the Splat Rain Drops when I was on vacation last year -- this was the perfect card for them! I colored them just a bit with a Copic marker (BG10 Cool Shadow) before applying them to the image panel. I sponged around the edge of the panel with Soft Sky ink. 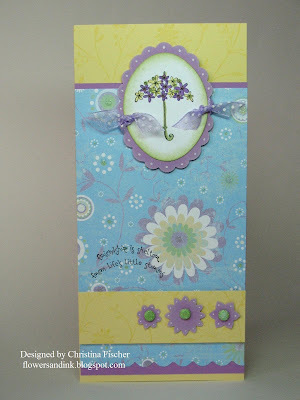 On the second card, I used my Cuttlebug and Stylized Flowers embossing folder to make the background. I colored the Chicky with Copics and added a brad to the flower center. The sentiment is from Little Penguins, also by C.C. Designs. I sponged around the image panel and small oval with So Saffron ink. Anyway, since I have basketball on the brain, I thought it would be a good time to share this card I made for my nephew's birthday. I had ordered this set a while ago, because I have very few "boy" sets, and my son and nephews are all basketball players. For some reason, though, I just couldn't figure out how to use it. I think I finally succeeded with this card. 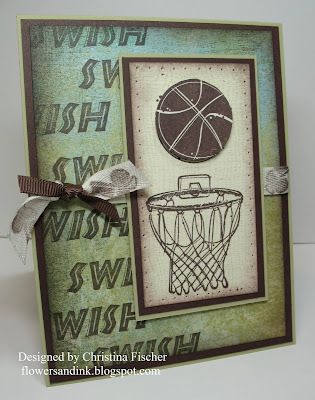 I stamped "Swish" directly onto the Stella Ruby paper. I used the Cheesecloth Backgrounder from Cornish Heritage Farms as the background for the focal image, stamped in River Rock ink. The focal image is stamped in Chocolate Chip. I stamped just the basketball one more time, cut it out, and mounted it on Dimensionals over the first image. I sponged Chocolate Chip ink around the image panel and the patterned paper. I also pierced around the image panel. The photo didn't pick it up, but I drew around the basketball rim with my Stardust Jelly Roll pen. It looks pretty cool IRL! The twill (from my stash -- manufacturer unknown), was stamped with the whistle image. I hope this works for a 12-year-old boy! What do you think? It's rainy outside today, so the Ways to Use It Challenge -- Just Spray It! -- seemed perfect! I combined it with yesterday's Sketch Challenge. I inked up this Penny Black stamp then spritzed it with water before stamping. Then I used Itty Bitty Backgrounds to make it look like I "sprayed" the ink over the image. The sentiment in the top corner is from Country Blessings (retired). I added some distressing and faux stitching for added interest and texture. Hi there! Happy Wednesday! It's a beautiful spring day here -- sunny, blue skies, and temps near 60 degrees F. It's the perfect day to share this fun summery card with you! 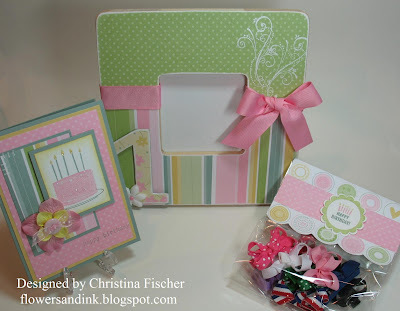 The layout is Jen del Muro's Sketch for You to Try. As soon as I saw her sketch, I knew I wanted to use this paper and stamp set. Just about everything on this card is Stampin' Up!, with a couple exceptions. I added a little texture to the background paper with my Cuttlebug and Spots & Dots embossing folder. The Ruby Slipper Glitter Dots were purchased at All That Scraps. Actually, the best part about this card is the way it smells. Yep, the way it smells. All That Scraps carries the coolest product for your cards -- Card Scents by Simply Sistas. They come in lots of yummy flavors, and you just brush a little around your image panel to make it smell terrific! I used cherry on this one, and I'm telling you it smells sooooo good! It's so much fun! There's not much more to explain here -- I hope you like it! Thank you so much for visiting -- have a wonderful spring day! Thanks so much for visiting today -- I hope you'll stop back! I'll have more to share with you then! Have a great night! Yesterday was officially the first day of spring, so I thought I'd celebrate with some spring flowers. 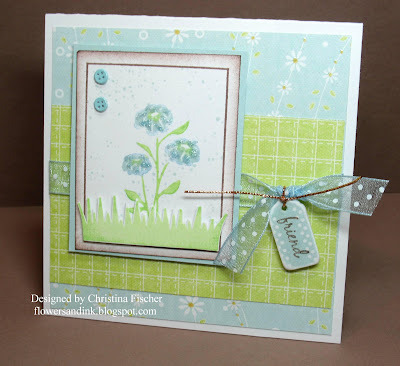 I made this card with Carolyn King's latest stamp set by Gina K. Designs, Framed Flowers. 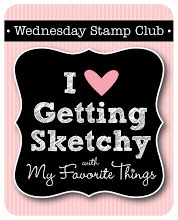 All ink is from Stampin' Up!. The cardstock is Crafters Select White by Papertrey Ink. It's the perfect weight for white card bases. The paper is, of course, For Peeps Sake by Imaginisce (are you tired of seeing it yet?). I used some of Gina K. Designs new Bling & Dazzle -- Pastel Button Babies and Plastic Tag Assortment. These plastic tags are so much fun to work with -- you can stamp directly on them, color on them with Copics, or cover them with paper like I did on this card. I applied the paper to the tag then sanded the edges. I inked just a portion of the sentiment stamp with a Close to Cocoa marker, then I stamped on the paper covering the tag. For the main image, I inked the flowers using Soft Sky ink, then drew around the edges with a Bashful Blue marker. The leaves were inked with Gable Green and Green Galore markers. I added a little sparkle and dimension to the flowers with some Baby Blue Stickles. The frame was stamped in Close to Cocoa ink. I added some SU! Itty Bitty Backgrounds around the image and sponged the edges. The grass was inked with Gable Green, Rock-n-rolled in Green Galore, stamped, and cut out. It is mounted on dimensionals. I added the Button Babies to the corner -- aren't they so cute? The ribbon is light blue dotted organdy from May Arts, and the copper cord is from SU! (retired). Edited to Add: I purchased the tin pails at All That Scraps. I'm back in business! My husband got us connected to the Internet last night -- yay! I've been wanting to share this card since Monday! 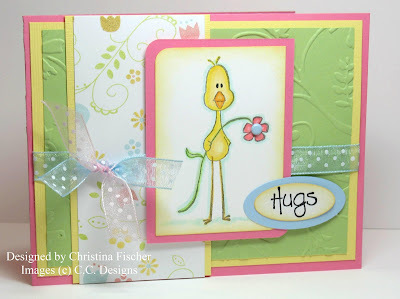 I used Jen del Muro's Sketch for You to Try, which was a perfect sketch for this little chick from Eggstra Special Easter by My Favorite Things. The paper is For Peep's Sake by Imaginisce. You'll be seeing a lot more of it in the next couple days, because I *love* it! :) Everything on this card is pretty self-explanatory, so I'll list the supplies for you. I will tell you that I machine stitched the paper to the Certainly Celery cardstock, and the flowers and scalloped circle are mounted on dimensionals. That's about it! Here's the completed gift set for my niece for her first birthday. The card is the Limited Supplies card from yesterday's post. I made a coordinating frame and bag topper for the hair bows. My friend Traci has her own hairbow business -- these little hairbows are just the cutest! All supplies (except the frame and ribbon) are from Stampin' Up!. 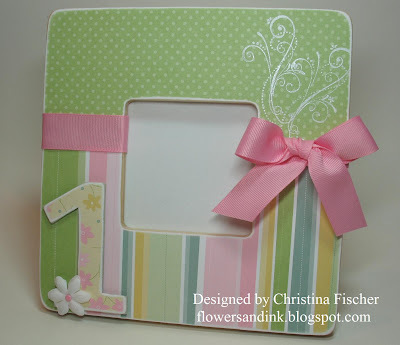 To make the frame, I covered the front and the chipboard "1" in Spring Fling Paper (*love* it!). I left the back natural. I sanded all the edges. I stamped the flourish from Priceless twice in White Craft ink and heat embossed with white embossing powder. I added a flower from the Pretties Kit and a Soft Subtles brad to the chipboard and adhered it to the corner with dimensionals. I tied ribbon between the two patterns of paper, making a bow on one side. 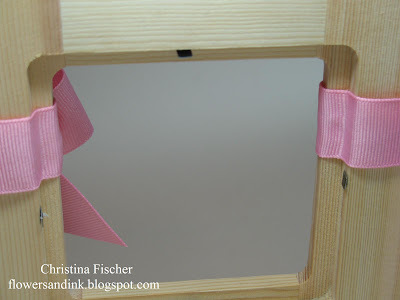 Here's a helpful hint: when tying ribbon around frames of this kind, be sure to tuck ribbon into the grooves so the photo will lie correctly in the frame. I used glue dots to hold the ribbon in place in the grooves. To make the bag topper, I folded a piece of the paper in half, then cut around the front circles to make the scallops. I used staples to hold it together on the bag, then I applied a strip of the dotted paper across the front to cover the staples. I used markers to ink up the stamp from So Many Scallops (Sale-A-Bration), and I punched it out with a Scalloped Circle Punch. I attached it to the center of the dotted strip, and that was it! Happy Friday, everyone! Ihave a card to share for today's Limited Supplies Challenge. The challenge is no tools -- that means no punches, no piercing tool, no Cuttlebug, no Crop-a-dile, no sewing machine -- you get the point. Any embellishments are those can be applied without the use of a tool. This was a good challenge for me -- I didn't realize how dependent I had become on my tools. So here's my "back to basics" card. This card is for my niece who will be one year old tomorrow -- happy birthday, Abby! :) I'm actually making her a birthday set to go with the card -- I'll share the rest with you later! The stamps are from Birthday Whimsy (Sale-A-Bration) and the paper is Spring Fling. I inked the cake stamp with markers, then I added a little sparkle with some Dazzling Diamonds glitter. I sponged around the panel with So Saffron ink. For my embellishments, I tied some ribbon through a Two Scoops button, then I stacked the button and Prima flowers. They are attached to each other and to the card with glue dots. I added some faux stitches in the corner with a white gel pen, and I created the "holes" with a Sage Shadow marker. I woke this morning to find out that my Hanging Treat Box is featured on the blog Inspirational. There are some amazing projects there -- you have to check it out! I was nominated by Jo -- thank you so much, Jo! :) She made her own fantastic box, and you can see it on her blog HERE. A Sketch Challenge, New Stuff, and a Lot of Flowers! Hi! I'm finally getting a chance to post my Sketch Challenge card -- actually, I just had the chance to make it about an hour ago! I think I was in the car all day today -- Kindergarten carpool, Anna's check-up, Taking Megan to volleyball practice, and taking Kyle to a friend's house. I was able to squeeze this card in before I started dinner. It was actually pretty quick and easy -- there is no stamping at all!! I found my SU! order on my porch this afternoon, so I got busy playing with new papers and embellishments. I *love* this Summer Picnic paper (from the Occasions Mini Collection), and I *love* the striped grosgrain. How can you not make a fun project with them? I added a little texture by running the background paper through my Cuttlebug in the Bloom Dots folder. The sentiment on the corner is a rub-on from the Sale-a-Bration rub-ons, Love & Happiness. The flower and red center are from the die cut Blooms, also available in the SU! Occasions Mini. The white circle and red scalloped circle were made with Marvy punches. I added some faux stitching with a Bashful Blue marker and some dots with a white gel pen. The two panels and the scalloped circle are mounted on dimensionals. Well, I'm off to finish dinner. We're eating late -- Megan just got home from practice! Thanks so much for visiting -- have a great night! ETA: new photo -- the other one was blinding me! I couldn't get the lighting right! 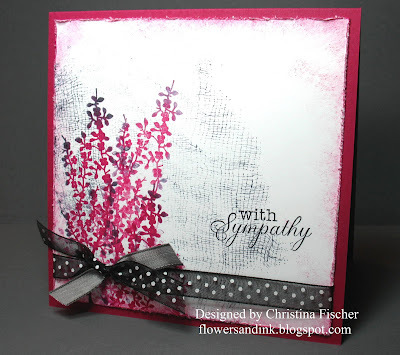 Today's Color Challenge at Splitcoaststampers is Basic Black, Basic Gray, and Purely Pomegranate. Since those colors are so deep and strong, I wanted to keep the background simple and white. 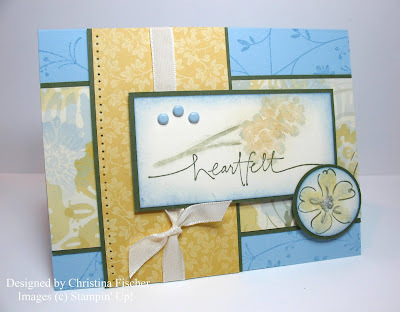 Actually, this card is VERY simple -- just a little bit of stamping and a ribbon embellishment, plus a little sponging and distressing thrown in! All images are from Cornish Heritage Farms. I partially stamped the Cheesecloth Backgrounder in Basic Gray ink. Then I took one of the images from Silhouette Blooms I, inked it in Purely Pomegranate, then rock-n-rolled it in Basic Gray. I stamped three times without reinking, then repeated the process. It gave me little "bundle" of blooms to tie the ribbon around. I distressed the edges with my SU! Cutter Kit, and I sponged with Purely Pomegranate. The sentiment is stamped in Basic Black ink. I tied May Arts dotted ribbon and SU! Basic Gray taffeta ribbon around the bottom. Happy Monday, everyone! I hope you had a great weekend! Around here the snow starting to melt, the temperatures are climbing, and there is a promise of spring in the air. With that in mind, I made this card for Jen del Muro's Sketch for You to Try. I don't make long cards very often, so this sketch was fun for me. The finished card size is 8 1/2" x 4", and it will fit in a business size envelope. You can click on the photo to see it better -- those long cards are hard to photograph! :) I used the retired SU! set Blooming With Happiness. 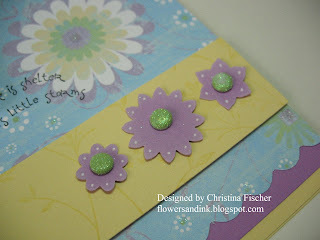 On the Barely Banana cardstock I stamped Pretty Petals in Barely Banana ink. The flowers were made with the Boho Blossoms Punch, and the centers are Sugarcoated Brads by Doodlebug Design (available at All That Scraps). I have been using these little brads a lot lately! They come in several yummy colors and give just the perfect amount of sparkle to your project! The heads are a little larger than those on SU! brads, so they work better if you need a center for a larger flower (like a Prima). I colored the image with SU! markers. I sponged around the white oval with Certainly Celery ink, and I sponged around the scalloped oval and the three flowers with White Craft ink. I couldn't help adding some dots with my Marvy white gel pen. I scalloped the bottom edge of the paper with a 3/16" corner rounder (paper guide removed), and I added some dotted ribbon to the image panel. The Banana panel and the scalloped oval are mounted on dimensionals. 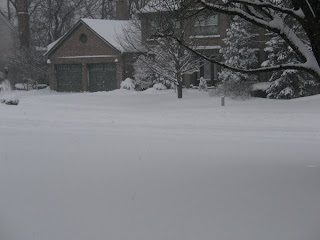 Okay, now for the "blizzard" photos... this is what it looked like this morning when I woke up. The first photo is the view from my front porch. 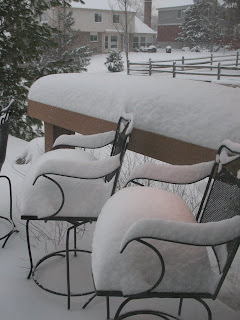 These next two photos are of my backyard deck. Look how high the snow is! This is pretty unusual for my home in northern Kentucky. We always get snow in winter, but it's rare that we get a foot or more in one snowfall. I know many of you get this kind of snow all the time, so you're probably laughing at me!! I guess it wouldn't be such a big deal if it wasn't MARCH!!! Last week it was near 70 degrees, and my tulips and daffodils were emerging! 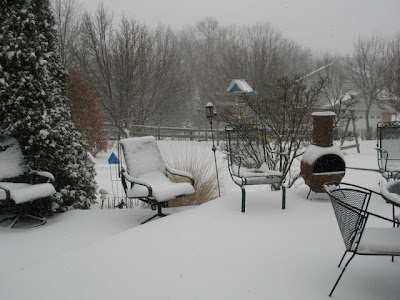 THIS is what it looks like in my backyard right now. 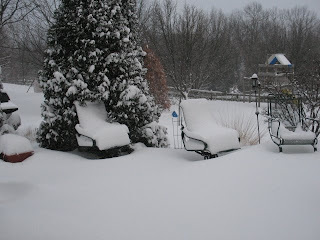 The snow is still falling -- 8-10 inches (possibly 12) by tomorrow. The kids are all home, Anna's doctor's appointment was cancelled, and Megan's volleyball tournament tomorrow has also been cancelled (whew!). I usually don't get a chance to post twice in one day, but hey -- there's not much else to do!! Since today's Limited Supplies Challenge is quick mini cards, it didn't take long for me to put this one together. 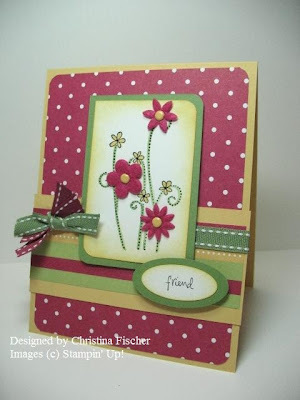 I combined it with the Color Challenge that Cammie posted on the Gina K Designs forum at SCS. This card is 4" square. 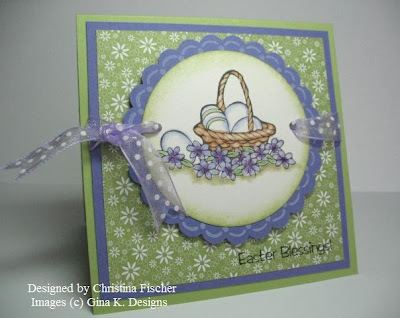 All images on this card are from Gina K Designs. The focal image and sentiment are from Baskets of Happiness, and they are stamped in Brilliance Graphite Black ink on SU! Shimmery White cardstock. I used Scalloped Frames & Doodles on the scalloped circle. The image is colored with Copics, and I sponged around the circle with Certainly Celery ink. 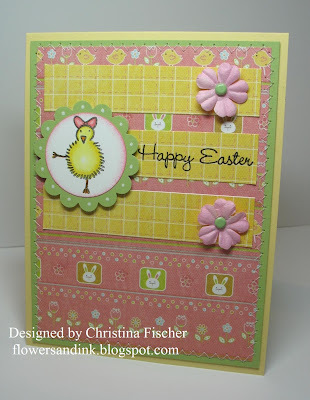 I need to get a little spring wherever I can right now, so this card will have to do! :) I think that's all for me today -- if the snow keeps falling, I just might have several projects to share tomorrow!! Happy Friday! As I look out my window, it's SNOWING... again. We're expected to get several inches over the next 24 hours. The kids are being released from school 2 hours early, and my afternoon Kindergartener doesn't have school today. Did anyone inform the Powers That Be that it's MARCH?!? Anyway, here's my card for this week's Amy's Friday Sketch. In keeping with my theme this week, I used a neglected stamp on this one. Tubby Time is one of the first C.C. Designs stamps I received, and it's so darn cute. I don't use it nearly enough. 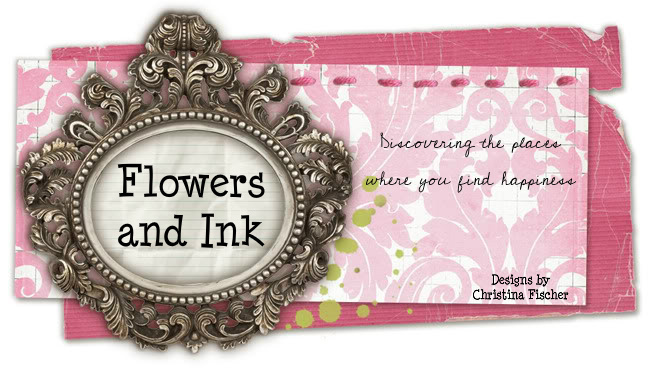 The background is the Polka Dots Big Ol' Background stamp. I paper pieced the tub and added Liquid Applique to the suds. Before the Liquid Applique was dry, I sprinkled some Dazzling Diamonds Glitter onto it to make the suds sparkle. Then I heat set it to puff it up. I added some sponging and faux stitching to the image panel, and I mounted it on dimensionals. The sentiment is from a Studio G clear stamp set I purchased from the Michaels $1 bin. I added some dots to the scallop and also mounted it on dimensionals. Hello there! I'm back with another installment in my "Neglected Items" series! :) This time, I dusted off my SU! Spiral Punch. It's not that I don't love it, because it's actually one of my favorite punches, but I just forget to use it! I only think to get it out if I'm doing an "office themed" project, but it is a great way to add interest to anything. 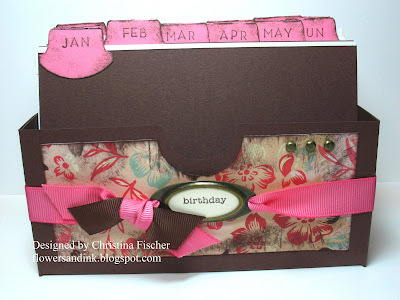 You can create faux filmstrips or just add a fun border, like I did on this card. 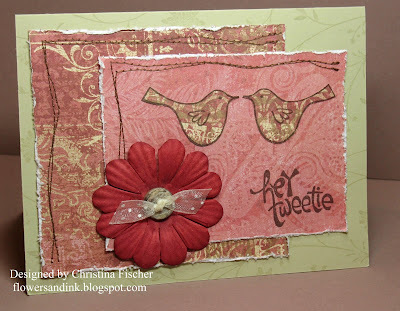 I created this card for the Guest Designer Challenge on the My Favorite Things Forum at SCS. I stopped by the forum last night for the MFT Release Party -- it was crazy as usual! During the party the GD Challenge was posted -- the challenge is to make a project with a monochromatic color scheme. The set I used is Serenity Now, from last month's MFT release. It hadn't seen ink before today -- that counts as neglected, doesn't it? ;) The background paper is BasicGrey Perhaps, and the girls are paper pieced with SU! Bali Breeze. The rest of the images are colored with Copics. 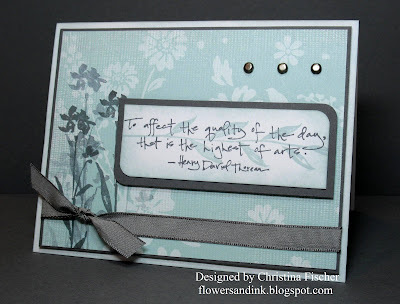 I curved the sentiment on the acrylic block before stamping -- one of the benefits of those clear stamps! I added some distressing and machine stitching, and the panels are mounted on dimensionals. This was a fun card to make, and I'm glad I used my forgotten punch! Tomorrow is another Amy's Sketch Challenge at All That Scraps -- you can be sure my card will include some more neglected supplies! Thanks so much for visiting today -- have a wonderful day! Hi, everyone! 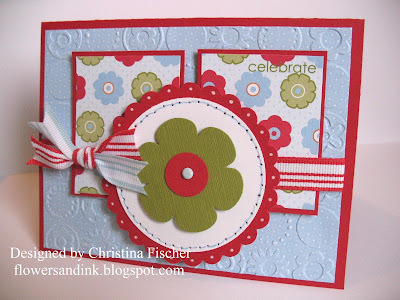 Yesterday I pulled out an under-used stamp set, Simply Said, for my Color Challenge card. That got me to thinking: I have so many sets, papers and tools that I don't use -- they get pushed to the side when the latest and greatest set, paper or tool comes along. So, I've decided to make this week a Neglected Items Week! When I saw today's Sketch Challenge, this set was the first to come to mind. Heartfelt Thanks was THE set to have a year or so ago, and there were samples all over the place... now I hardly ever see it. It is truly one of my favorite sets, and it deserves a little more love than I've been giving it! 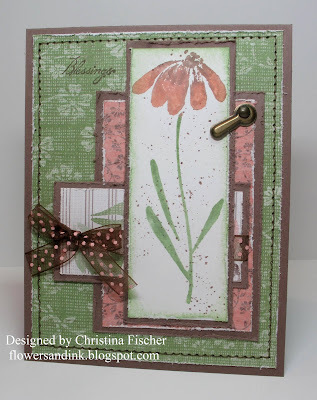 Here it is, combined with Le Jardin paper (another neglected item) -- I was pleased to see that it coordinates very well with the Pretty Petals background stamp! On the center panel, I stamped the flower image twice in Versamark, then I did Poppin' Pastels over it. I used my finger to apply Stampin' Pastels directly to the Versamark. I then added the sentiment and sponged around the edge. For the flower in the circle, I stamped the image in Always Artichoke then watercolored with an Aquapainter and inks (So Saffron and Bashful Blue). I added some Dazzling Diamonds glitter to the center. I pierced down the side of the vertical panel, then I added ribbon and brads. The center panel and circle are mounted on Dimensionals. 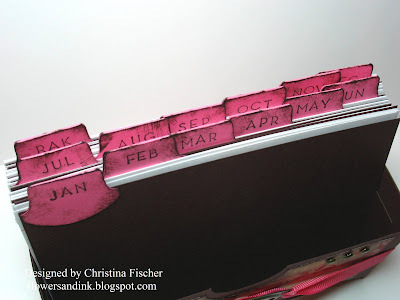 Here's my challenge to you -- dust off those unused supplies and get stamping! You just might fall in love all over again! :) Thanks for visiting -- have a great day! Good morning! It's a rainy, cool day here -- good for staying inside and stamping! :) Actually, I was up and out early this morning -- I had to take my two oldest kids to an orthodontist appointment before school. I was able to check out today's Color Challenge when I got home. My youngest did not go to school today, since she has a nasty cough and cold, so I was able to get a card made while she napped. The colors today are Wild Wasabi, Purely Pomegranate, and So Saffron. This card came together pretty easily with the help of my Cutie Pie paper! Just yesterday I had decided to use some of my neglected stamp sets, and Simply Said was perfect for this design. 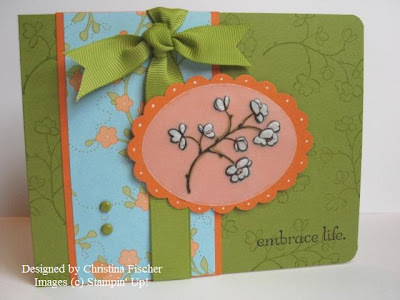 I added some Flower Fusion flowers and some brads to the stamped image, and I embellished with stitched grosgrain. For the sentiment, I took the stamp and inked up just the the word "friend" with a Basic Black marker. That's it -- a simple and fun design! Sometimes that designer paper does a lot of the work for me! :) I hope you're having a good day -- thanks so much for stopping by! Hello! I hope you had a great weekend! It's Monday, and that means a new Technique Challenge at SCS. Today the technique is Debossing Vellum. I had never done this technique before, so I was glad to try something new. My fellow ATS Design Team member Linda Black is today's guest host. Her technique tutorial can be found HERE or on the SCS challenge thread. I really like how my card turned out, but the process was not easy. I am a sloooooooow card maker when I'm designing my own projects. I agonize over layouts and details -- I try something, look at it a while, try something different, and eventually decide I'm happy with it. That's what happened with this card. Deciding on the image to deboss was no problem, and I chose my paper and colors just fine, but then I spent waaaaay too much time getting all the details just right when it was time to put it all together! Most of it is self-explanatory, but I will tell you that I colored behind the debossed vellum with markers, then I applied the vellum oval to the Pumpkin Pie scalloped oval. I used my Quickie Glue Pen (*love* that thing) to draw a thin line of glue around the edge of the vellum. It's difficult to adhere vellum without the adhesive showing, but the Quickie glue is not too noticable. I added dots to the scallops with a white gel pen, and I mounted the scalloped oval on dimensionals.